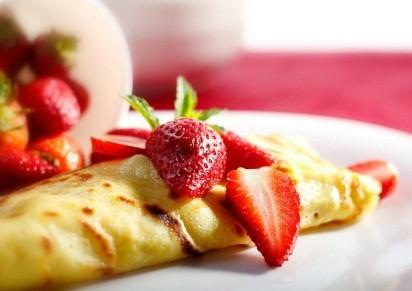 French crepes recipes are valuable assets to your menu. Not only are crepes elegant and easy, they are a fabulous way to use up leftovers without being boring. While crepes are often compared to pancakes the similarity ends with the shape. Crepes are made up of a very thin batter that usually has a high percentage of eggs in the ingredients. The finished crepe is delicate, thin and tender. Rather than stacking and pouring syrup over the top, crepes are usually rolled around some sort of filling. They are appropriate for any time of the day or any occasion. In fact, in France crepes are often a casual street food, served from roadside stands. Crepe filling can be savory or sweet; this is where the chef can use his or her imagination. The filling can be anything from leftover ham and Swiss cheese to chocolate butter cream. Some crepes, as in the case of the famous Crepes Suzettes, are not filled at all but folded and have a sauce added to them. While crepes are simple to make you may need a little practice to get them right every time because of their delicate nature. Here are some tips to ensure success. Allow all the ingredients to come to room temperature before making the batter. Always hand whisk the ingredients. This will keep the gluten from developing in the batter and ensure a tender crepe by allowing the flour to absorb more of the liquid ingredients and cause any gluten that was developed during mixing to relax. Allow the batter to rest at room temperature for 30 minutes to an hour before you begin to cook your crepes. If your batter seems to thicken up you can add a tablespoon or so of water. The perfect batter will have the consistency of heavy cream and will pour easily. A ten inch nonstick skillet with rounded sides is perfect for crepe making. You can also buy crepe pans or electric crepe makers. Allow the pan to heat for a few minutes before beginning your crepe. Rub the pan with a little butter for flavor and to keep the crepe from sticking. Almost everyone has to throw the first crepe of the batch away; don't feel badly about it. Use a ¼ cup measure to add the batter to the pan and swirl it around so it completely coats the bottom of the pan. Now that you know the secrets for perfect, delicate crepes it is time to pull out the ingredients and make a few of them. Keep in mind that the actual crepe recipe has little variation. The differences are in the fillings and sauces, as well as the technique. Allow the ingredients to come to room temperature. Whisk the eggs with the milk and butter until frothy and well blended. Add the flour and the salt, as well as the optional ingredients for sweet crepes. Allow the batter to rest for at least 30 minutes or up to an hour. Heat up a ten inch nonstick skillet or crepe pan. Rub with a little unsalted butter. Pour in ¼ cup of the batter and cover the bottom of the pan by using a swirling motion with your wrist. Cook until crepe is cooked through. The top will be shiny. Remove from pan and cover with a paper towel while you make the rest of the crepes. French crepes recipes are all nearly the same; the fillings and sauces are what sets them apart from each other. Reserve a little of the sauce from the filling and use it to put over the top of the crepe, especially when making savory crepes. Ham, broccoli and onions in a Swiss cheese sauce. Add a little grated cheese over the top and broil for a few minutes. Crepes freeze very well whether they are filled or not. Filled crepes can be place in an airtight freezer container with waxed paper between the layers and frozen for up to three months. Put waxed paper between flat crepes and freeze them flat in a large, airtight freezer container. French crepes recipes may seem to be elegant and difficult to make but they are actually the workhorses of a busy kitchen. With a little practice you will find that you are making perfect crepes in no time.